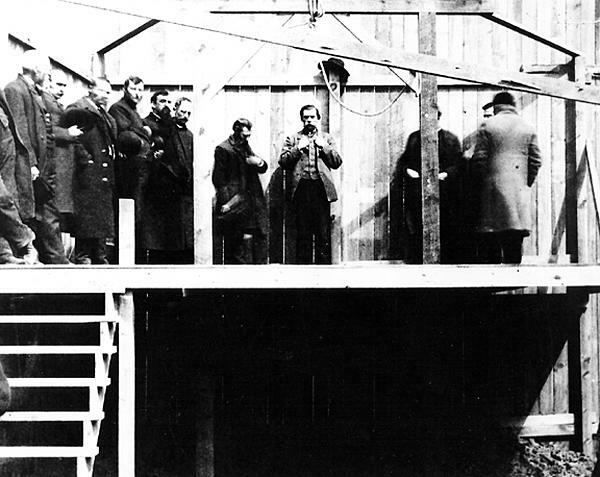 Men gather on the gallows the day of William Jackson Marion's hanging. 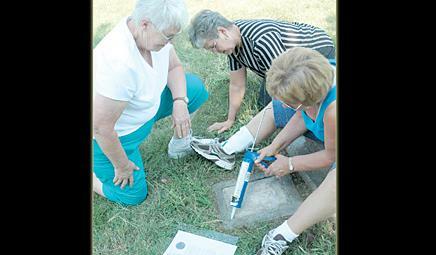 Sisters Della Schwindt, Marilyn Kirk and Karen Younghans replace the Plexiglas covering the governor's pardon on William Jackson Marion's grave. Marion was granted a pardon for the murder of Jack Cameron in 1987, 100 years after he was hung in Beatrice for the murder. Loaded up in a white van, five ladies from Missouri and Kansas pulled into Beatrice Friday night for a weekend excursion and to complete a task for their late father, Elbert Marion. Kirk, along with her sisters, Della Schwindt of Salina, Kan.; Evelyn Goodwin of Bonner Springs, Kan.; Karen Younghans of Kansas City, Kan.; and sister-in-law, Judy Marion of Webb City, Mo. ; were here to clean-up the headstone and replace the aging Plexiglas protecting the paper that declared the Governor’s pardon of their great grandfather, William Jackson Marion. “Daddy would have wanted that fixed,” Younghans said. “He would be applauding in his grave,” Schwindt said. The story of William Jackson Marion is one that is deeply etched in the history of Beatrice, for he was the first, last and only legal hanging in Beatrice. The story began when William Jackson “Jack” Marion and Jack Cameron came to Gage County looking for work in the spring of 1873 near Marion’s home in Liberty and to visit family, according to historical archives. Cameron was remembered as a young Iowan, attracted to this territory by the prospect of lucrative employment in the building of the Rock Island lines through northern Kansas and southern Nebraska. Working with a grade constructing outfit on the mainline, Cameron met and became friends with Jack Marion, a burly and adventurous member of the Wildcat neighborhood near Liberty. During the stay, Jack Marion purchased Cameron’s team of horses, making a small down payment. However, until he could pay the entire balance, Cameron would keep the horses. They loaded up Cameron’s wagon and team and made the trek to Gage County. The men stayed for a few days before departing, traveling through Blue Springs and Beatrice. But, after leaving Beatrice, Cameron vanished. A month later, the badly decomposed body of a man whose skull had been pierced by three bullet holes was found in Indian Creek, near Odell. The body was declared to be that of Cameron, as the body was wearing the clothes he was last seen in before he vanished. It did not take long before Jack Marion was named as the murderer, as it had only been weeks that people witnessed him driving the dead man’s team through Beatrice, wearing Cameron’s clothes and boots. A hunt pursued of Jack Marion and he was ultimately found and arrested in Kansas 10 years later. Sheriff “Cap” Heron had followed Marion’s trail and captured him shortly before he had closed his second term of office. A desperate search among the county records for the proceedings of the coroner’s jury of 10 years before (In those days a suspected murderer could be held on a coroner jury verdict until the grand jury had disposed of the case) resulted in the issuance of an order of capias and Marion was brought to Gage county to face the grand jury. At that time, Judge R. W. Sabin, a venerable attorney today, had just been elected district attorney and was shortly inducted into office, according to historical archives. Sabin was not pleased with the prospect of prosecuting a man for a crime committed a decade before, which meant that the continual shifting and trekking of settlers had swept away many of the witnesses. With the zeal of a young and rising attorney, Sabin opened his campaign of prosecution. Several months passed and the work progressed in a faltering manner. The trail seemed a long way off and conviction doubtful. Then one day the district attorney had business in Falls City, and, while there, he learned that a Mrs. Warren, Marion’s mother-in-law and a member of the Marion family group near Liberty when the crime was committed, was living in that city. The district attorney paid her a visit. Mrs. Warren’s description of the visit, as well as the clothing worn by the two men, later proved of so much importance. It was evident that her testimony, if it could be obtained, would cinch the case. With the state’s case completed, Marion was indicted by the grand jury for murder in the first degree; tried on the charge before Judge S. P. Davidson, and found guilty after just one hour of deliberation. The trial was held in a hall where the Elks club building now stands, the present courthouse not having been built at the time. The prosecution was assisted by the late R. S. Bibb, and the counsel for the defense consisted of the late L. W. Colby, Alfred Hazlett and Bates. Among the sensational developments at the trial was the introduction of the murdered man’s skull, with its three bullet holes. The identification of the dead man from the clothing exhumed with the body was also unusual at the time. Jack Marion was convicted and hung in the gallows on March 25, 1887. Four years later, Cameron reappeared. More than 20 years ago, Elbert Marion, the grandson of Jack Marion, became heavily involved in genealogy and devoted the last years of his life to getting the governor’s pardon for his grandfather. “Whatever he did in life he didn’t do it half-heartedly, he did it with a vengeance,” Kirk said about her father’s work on the pardon. Elbert Marion admitted that his grandfather may have been a scoundrel and possibly a gambler and a ladies man, but he was not a murderer. His years of work proved to be fruitful. In March of 1987, 100 years after Jack Marion’s hanging, Gov. Robert Kerry issued a pardon. Elbert Marion had placed a headstone on the unmarked grave in the old Beatrice Cemetery and a copy of the pardon. Elbert Marion’s daughters first thought the story of Jack Marion was strange, but have since come to appreciation of the family history their father uncovered. “The older you get, the more interesting it gets,” Younghans said. Knowing how much their father, who died in 1988, would have appreciated the work they did at the gravesite on Saturday, made the trip worth it, they all said. “I have come to think that this is important because I don’t want it to die with our generation,” Kirk said.